If you are a Samsung user and want to switch to a Redmi now, then you can put your eyes on this article. 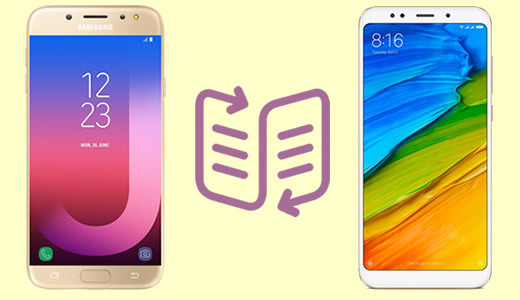 We are going to tell you how to transfer data from your Samsung to your new Redmi Note 5? 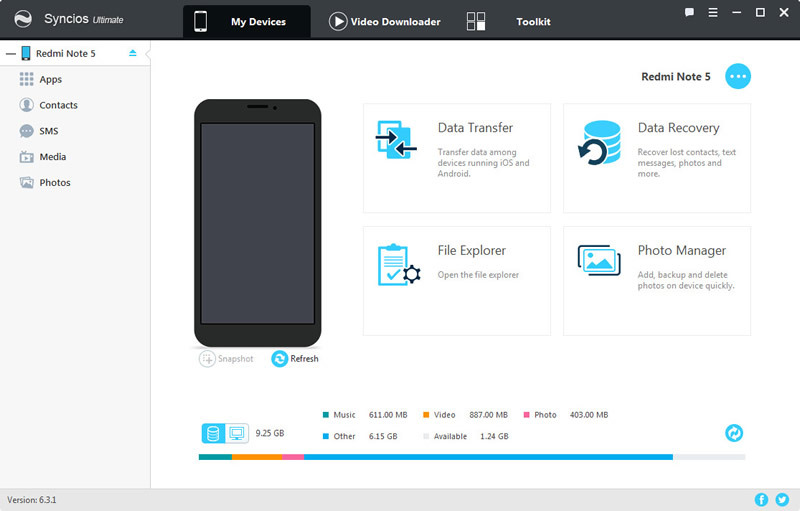 Syncios Data Transfer has four main functions, Phone to Phone transfer, Backup and Restore your phone, Restore Phone from iCloud and Restore Phone from iTunes. 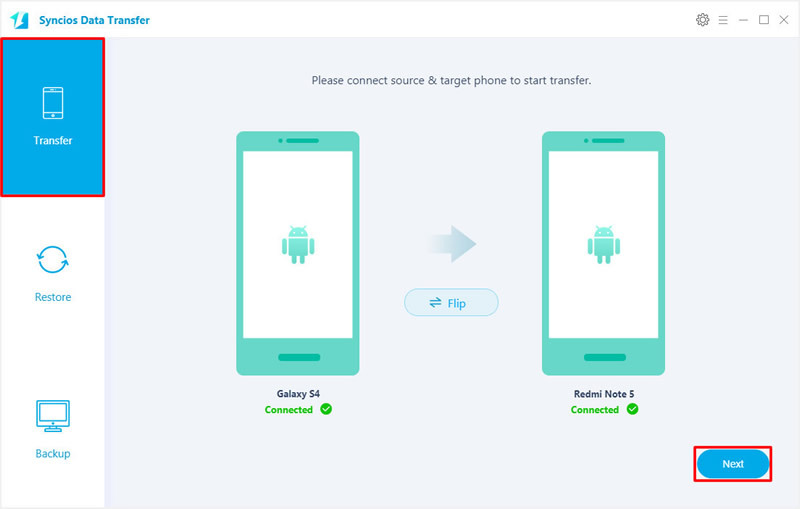 Now we can use Phone to Phone Transfer and Restore your Phone functions to transfer Samsung data to Redmi Note 5 in one click operation. Launch Syncios Data Transfer and connect both your Samsung device and Redmi Note 5 to computer via USB cable. Please ensure Samsung phone is on the left side while Redmi Note 5 is on the right side. If they are not, click on 'Flip' to switch their positions. Then click 'Next' to select the certain contents you need to transfer for. All the transferrable contents will show on the screen. If you want to transfer all data from Samsung to Redmi Note 5, select 'Select All' and all the contents will select by default. If you want to transfer some special contents, just simply select the checkbox of the contents and click 'Next' to launch the transferring contents. Tips: Please click -->here for help if you encounter any detection problem during the process. Please pay attention that only when Android phone and computer are access to the same network can Wi-Fi connection works. 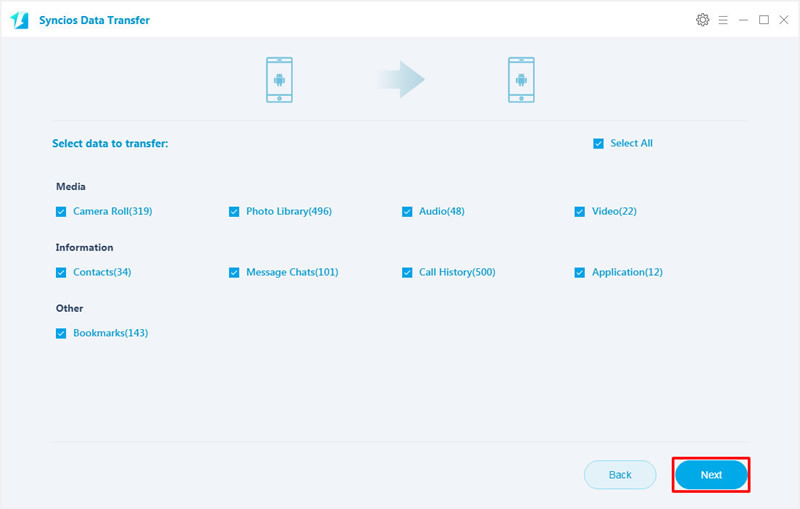 Syncios Manager is a comprehensive phone manager which can not only manage your phone but also gather the function of video downloading, GIF making, ringtone making, etc. Please launch Syncios Manager on your computer and connect your Samsung and Redmi Note 5 to computer. Wait for synchronize. We use 'Music' content as a demonstration. 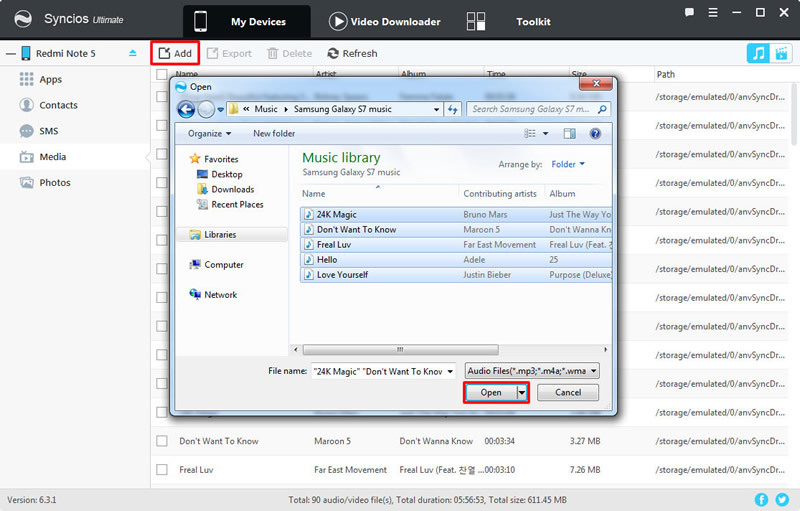 Export Samsung Music: Now we do operations on Samsung first. Select the certain music you want to transfer. Just select the checkbox in front of the certain music and click 'Export' button on the menu bar. Then choose your saving route and click 'Export'. Import Samsung Music to Redmi Note 5: Then we do operations on Redmi Note 5. Click 'Add' button on the menu bar. You can choose 'Add folder' or 'Add file' of your willing, then simply choose the music folder or specific music file you've just export early and click 'OK'/'Open' to import. 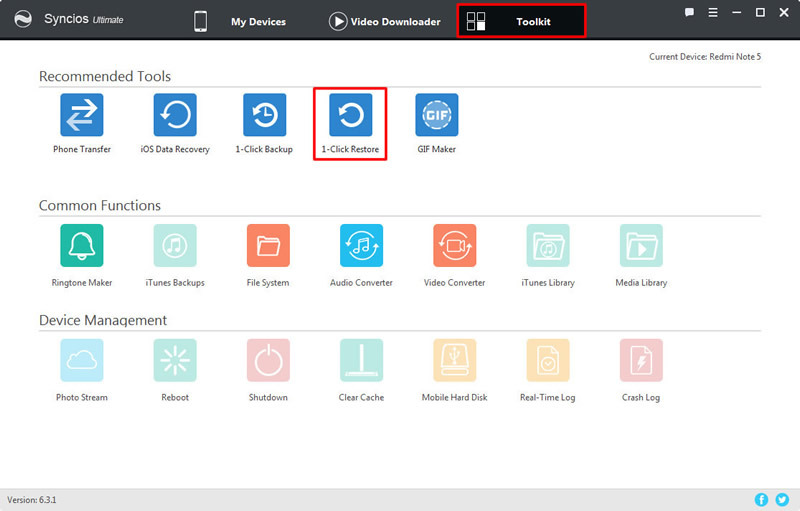 You can also retrieve Samsung data to Redmi Note 5 by using Syncios Manager's 1-Click Restore function. Go to 'Toolkit' module and choose '1-Click Restore' function. This function is suitable for whom ever used '1-Click Backup' to backup Samsung phone before. Choose the certain Samsung backups you want and click 'Next' button, then select the contents you want and click 'Start Recover' button to launch the recovering process. Xiaomi Mi 2/2A/3/4/4i/4C/4S/5/5S/5C/6/A1/A2, Xioami Mi MIX/Mix 2, Xiaomi Mi Max/Max 2, Redmi 2/2A/3/3X/3S Prime/3S/3 Pro/4/4X/5/6, Redmi Note 2/3/4/5/6 Pro, Mi Note/Note 2/Note 3, Redmi Pro, etc.